I built out my second van this summer and I'm selling here in California. It is built for a climber by a climber... Check it out if you're interested. You had me at SW Montana...! Great shots from the Bridgers, Hyalite, Gallatin...! and care you took which looks to be way up there. and hats off on kingpin. we were crawling around down there back when you were just a twinkle. tried our best to keep it tucked in and leave no trace. ... how'd we do? by walking it's length after a long & deep, DEEP freeze. Gotta love Froze to Death. I'm in Sacramento, would love it, but honestly, I don't have $75k to drop right now. Plus I think it might be fun to build it myself. Nice display of creativity and talent, for sure, but I’d be pretty surprised to see a home brew go for 30k-ish for the upgrades - pretty bare bones except your talent with the cabinets. Maybe post back what that thing sells for, I’m sure I’m not the only one who is curious what this stuff is worth. No jab at you, I'm just surprised that is what these are going for. Excellent work and some good ideas. I forwarded your links to a couple friends. (My wife would want more luxury). What does the ST think this van should go for? Enquiring minds want to know . . .
Sportmobile build quality has a bad reputation - but also keep in mind this is not a kitchen built to last 50 years of daily use either and would be a waste of money if it was - to a degree. I think another good benchmark is the used market for commercial rigs - airstream, roadtrek, etc. That said, I’m not seeing much more than 10-15k over the vehicle price for actual value. The question in my head is the market value for the quality level of the cabinets - and if that buyer is interested in no cooking appliances, no hot water, etc. Hard saying, but curious. Well, a friend just bought a 2017 sprinter this summer. Totally strip down basic without windows like the one in the OP off the lot in Sacramento. To get fully decked out by another company that does these things including windows installed and all solar, bed, sink, captain chairs that swivel, table all that stuff, etc...(no fridge though) was another $25,000. Can i rent your Apache to carry my new free memory foam? Where did your friend get a 2017 diesel hi top sprinter for $25k in Sacramento this summer? I've been looking, in Sacramento, and those things run closerto $40k. Maybe a gas Ford Transit could be had for that price, but not a diesel sprinter. Well, I suppose if somebody wanted to gift me with that Sprinter, I'd accept with grace. Very nice woodwork, but I can't get past the people's need for cabinets. They just seem so wasteful of limited space to me. 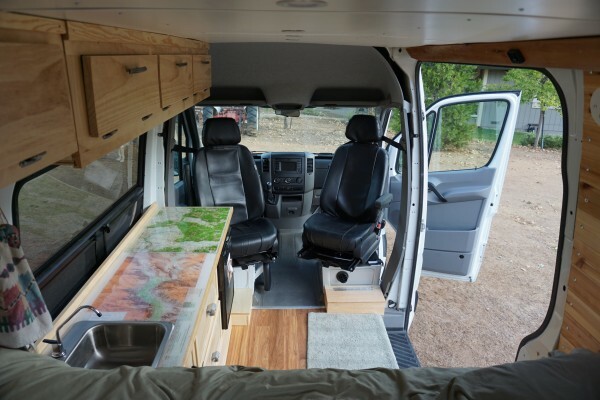 Were that one being built to my design specs, I'd like the side wood panels and flooring, and I definitely like to raising bed with open storage below, accessible from bed or back. That's the best point, IMO. But I would forego the sink, and make that countertop pull double duty as a work table. Fridge - yes. Everything else - no. Bins that can be kept in place, and easily pulled out. Same for the upper rail - open space for bins that are held in place during travel with tension cord or swaged metal cable. Yeah - that's the other thing I've found with these home built vans - everyone wants and does something different. It's kind of cool, really, the personal expression. Thing is, IMO, at the 75k for new equipment price point, the customer is going to get exactly what they want. If it were 75k used for something that would cost 120k new, they might accept some compromises. Seems to me this guy's only customer is going to have to really like what has been done here - and it is cool and 1-off money-can't-buy-this-just-anywhere kind of thing - however, that 75k could also get you a LOT more amenities like cooking, hot water, professional level trim and blending in the interior, etc - all brand new and made to order - elsewhere - and all you have to give up is the artsy artisan cabinets. That's what I'm curious about - the market here - for this kind of product. He’ll be lucky to get $50K. It’s a buyet’s market out there, especially for home made rigs. He’s acting like he expects T (@$50/hr) & M + 20% profit. Looks like for about $100k you can get a new pretty loaded new one so $75k doesn't sound cheap, but if it's comparable, it doesn't sound crazy expensive either. The Delhi Dog example of $50k for a nearly nice, nicely kitted van sounds like an unusually good deal to me (but again, I'm a van noob). The vans on that site are light-years different than the OP's. Go touch and feel in person, then try to make one, to fully understand. 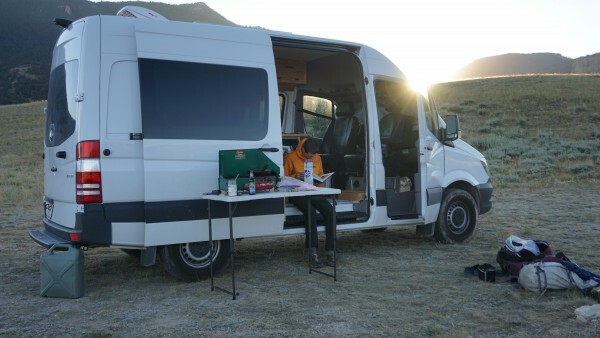 Hard reality: A DIY will be unable to duplicate a van on that site for less money. It's same reality as not being able to build a car in your garage from scratch for less money than you can buy one new for. You just can't do it. It's impossible to duplicate on your own the economy of scale and the man hours of experience and design. The custom one-up outfitters are super expensive for what you get comparably - for the same reason. They're better, they have experience and systems that add economy - but they're not Winnebago or Airstream or even Sportsmobile. So you settle for less - for less money - and some are better at doing that than others. In fact I'd say the OP is better than most. His van is not comparable to any on that site though.